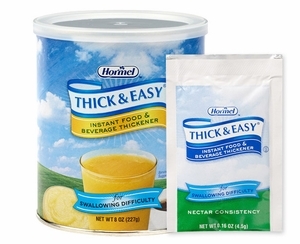 Hormel Thick and Easy Instant Food Thickener easily blends with hot and colds foods and liquids. Thick & Easy Food Thickener is safe for those with swallowing difficulties. It can be blended into nectar, honey, or spoon thick consistencies. Ideal for those with dysphagia so they can enjoy tasty, nourishing foods while maintaining a properly hdrated and healthy nutritional diet. Available by the can or individually, measured out packets.